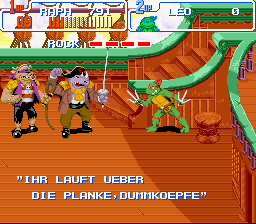 I’ve played a grand total of three TMNT games: TMNT (NES), Tournament Fighters, and this game. Out of those three, this is definitely the best. It’s got a crazy sense of humor, offers a challenge, and has co-op, so you can play with your sibling. 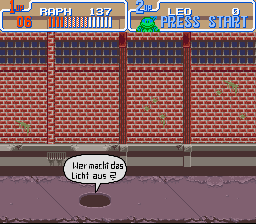 The game plays a lot like Double Dragons are whatever other Beat-em-up you want to think of. The controls seem simple enough, although, due to my lack of skill, it sometimes seems random, although I suspect certain factors, such as distance and direction account for some of the different attacks. You can use a “special attack” that takes away a chunk of your health, but can deal massive damage (or outright defeat most mooks). You can jump and dash, and every turtle is playable (except for their cousin, Slash). The stages vary and have a sense of personality. The whole game isn’t comprised of beat-em-up levels, either. There’s a stage where you’re surfing inside the sewers and another that’s in “behind the turtle” perspective. 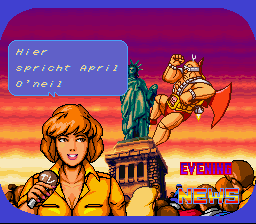 They’re all pretty fun anyhow, though, and they do generally follow the same controls as the beat-em-up stages. 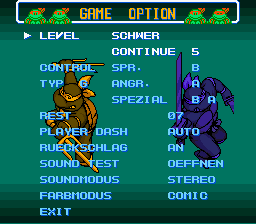 There’s a mini fighting game mode where you can select a turtle and beat up on another turtle that can be either CPU or sibling controlled. It’s simple but I guess it was just a bonus mode added in for good measure. You’ll probably play with it for a minute and never touch it again. The graphics for this game are bright and colorful. It’s based on the old 80’s-90’s cartoon, so it fits, I guess. It’s obvious by April’s yellow jumpsuit and the inclusion of several TV-only characters. And, well, Shredder is the main villain yet again. You can supposedly change the graphics style to match the comic book, but to be honest, I never noticed a change at all. If they’d even at least change the color palette to black & white, maybe it’d feel like the comic book, but it doesn’t change a pixel of anything as far as I can see. Maybe it adds some contours or shadows? Bah, I don’t know. At least I can tell that my turtle’s foot is in pain and that those purple spike things are not a good thing. There’s also a lot of variety in here, and most stages won’t share a lot of enemies with each other. The sounds are alright. There are a few digitalized voices, such as “COWABUNGA!” which are a neat touch. Most of the more memorable sound effects are on the comical side, like when a turtle stubs his toe and goes “OW OW OW” all digital-like (so it sounds more like a robot than a turtle, but I can let it slide because it’s pretty awesome in its own right). The soundtrack is largely forgettable, however. The story is… Shredder is terrorizing New York! So you go do what any sensible Ninja Turtle would do: Go and beat him up. Except, he sorta wins and sends you back in time. So, it’s your job to go through time, fighting dinosaurs and robot surfing until you can confront him again and stop the time travelling madness. 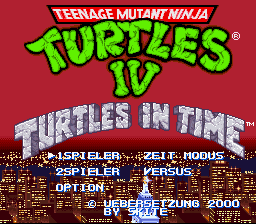 It’s all largely an excuse to play as the turtles, but it doesn’t really matter. It’s pretty awesome anyway. This game is for anyone who enjoys the TMNT, Beat-em-ups, and funny graphics. Most people can beat the easier difficulties with some practice, but the hardest difficulties can over more experienced players a challenge. This patch is for the prototype ROM. All text inserted except time trial. The only known bug is one where you have to move the cursor in the option menu to change the English.